Thailand. Few countries conjure up sweeter visions of turquoise waters, gentle hills and palm trees swaying in the ocean breeze. The kingdom’s manifold natural wonders are no less beloved than its optimistic and inviting joie de vivre. Thanks to the country’s cordial locals, Thailand embraces visitors from all walks of life, making it a dream destination for couples in search of romance – including LGBT+ ones. Former Siam’s excellent hospitality sector leaves no stone unturned to help visitors create memories that last a lifetime. Whether you’ve come to treat your other half to quality time on a surprise trip (lucky them!) or to symbolically tie the knot, hotels bend over backwards in the name of romance. Here are our favourite properties courting couples. Just around the corner from the Sukhothai lays Bangkok’s idyllic Lumpini Park. Sweethearts stroll here to relax in the Chinese pavilions overlooking several pretty lakes and ponds. Feed the fish or pedal out on a swan boat while birdsong rings from the nearby Frangipani trees. On Sunday afternoons, jazz bands immerse the park in old-world charm. All this happens on the hotel’s doorstep. But your heart may skip a beat on the Sukhothai’s grounds, too: aside from the dramatically illuminated exterior (think brick stone chedis, water lily ponds and Thai-style rooftops), warmth and sensuality radiate from the silky fabrics and smooth wooden surfaces of the hotel’s interiors. Many find the ambiance so enchanting; they rent the Garden Villa or the Ballroom (have fun choosing!) for their wedding ceremony. Sound enticing? Expect a pair of traditional jasmine garlands and a customized wedding cake from the pastry kitchen… We’re in love. Get away from the crowds at this LGBT-friendly resort on secluded Naka Island, off Phuket’s east coast. Arguably, this laidback getaway is a dream for couples looking to unwind. Backed by thick rainforests and fronted by a sea that kisses Naka’s pretty shores with unwavering passion, lovers drift off into sleep (cuddling, we suggest!) to the sounds of nature and nothing but. Do engage in the many activities on offer: from leaf folding workshops and couple massages to private cooking classes for sweethearts who like to keep things hot and spicy! Our favourite pastime at the Naka, however, might just be jumping on a speed boat that whisks you away to nearby Phang Nga Bay for an intimate glimpse at Thailand’s most romantic landscape – though you could also celebrate your love island-hopping on a luxury yacht! Whatever you do, remember to return to the Naka’s beachside Z Bar for a picture-perfect sunset. The former capital of the ancient Lanna Kingdom, Chiang Mai, has a romantic reputation that’s been long in the making. Everything here is somehow steeped in history, which adds to the city’s mysticism and charm. Chiang Mai truly rests in the loving lap of the surrounding, ancient forests. This air of affection is beautifully continued at 137 Pillars House, where dark wooden floors, sensual orchids, authentic earthenware and generous French doors convey an ardent allure. 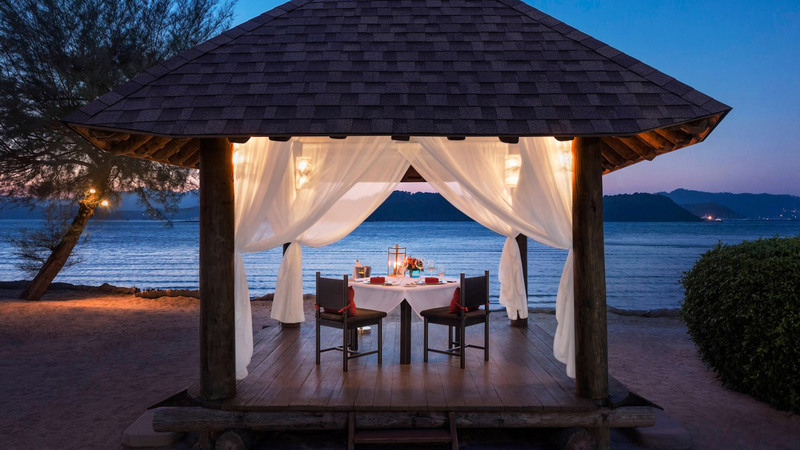 We could tell you about the property’s piano lounge and its wine cellar, but the way to someone’s heart is, of course, through their stomach: whether you opt for a bespoke, private dinner or a Khantoke dining experience featuring a hypnotic Lanna dance – every meal at 137 Pillars House is a chance to make a memory! On special occasions such as Valentine’s Day, expect a serenade by a guest violinist – what’s not to love?